This entry was posted on Thursday, June 2nd, 2016 at 4:22 pm. As a child, some of my favorite horse books were C.W. 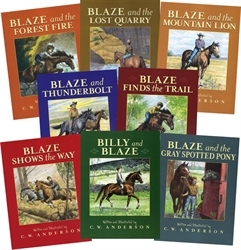 Anderson’s Billy and Blaze series. These were beautifully written AND illustrated by Anderson, and I was always mesmerized by his gorgeous black and white pencil (I think) artwork. I had a major crush on Blaze and thought he was the most handsome horse in the world! There are technically eleven books in the Billy and Blaze series, but eight are sold as a collection as three are much harder to come by. I have all but two, Blaze and the Gypsies and Blaze Finds Forgotten Roads. Sometimes I see them on ebay or Amazon, but they are usually VERY pricey! My favorite was the first one I ever read, Blaze and the Forest Fire. My elementary school library had a copy, so I did what any horse-crazy girl would do – I checked it out repeatedly. I’d check it out for a week, read it a million times, check it back in, and then check it right back out thirty seconds later. Finally, my librarian told me that I had to give the book a break so other kids could have a crack at it – ugh! Years later when I was in high school and my sister was finishing up elementary, the library was having a “book sale.” They were in the process of switching out some old inventory and carts of books for sale lined the hallways. My mom just happened to walk by on her way to picking up my sister from school, and what do you think was on the cart? My beloved copy of Blaze and the Forest Fire. My mom quickly grabbed it for ten cents and presented it to me later that day. I still have that copy sitting proudly on my bookshelf! Did you read the Billy and Blaze books as a child (or as an adult? – there is no judging where horse books are concerned)!! C.W. Anderson published many books over his lifetime, and I would like to try and collect them all!